"Lacey" made her debut in Perth on 28 July 2001. She was awarded Best Intermediate In Group. "Lacey' went BOB and Best Australian Bred In Group at her 2nd outing. The beginning of Lacey's show career in WA saw her competing against her older half-sister Aust Ch Schameland Kokomo. It was Lacey's turn to shine, and shine she did, when Koko returned to her breeders in April 2002. "Lacey" was initially handled by Darryl McDonald. Thanks Darryl!! And special thanks to Darryl's Mum, Dianne, Lacey's favourite "Nanna". 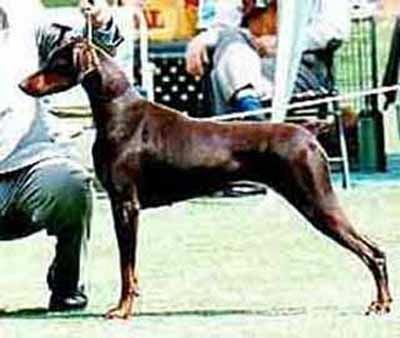 As of April 2002, "Lacey" was campaigned by our friend, Nichole Whyte of Bravadobe Dobermanns. Thanks Nichole!!! "Lacey" was not heavily campaigned and titled with a BOB in October 2002. "Lacey" had retired from the showring to share the couch with Bluedog at Jan & John's place. Vale Lacey Lulubelle - you will be very much missed by all those who loved you.